This is the first post in What's New, a semi-regular series where we talk about our ideas and what we intend to pursue. 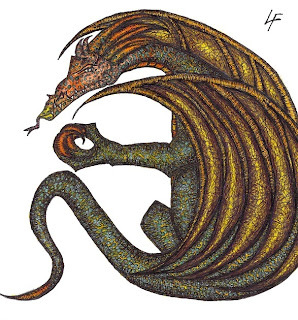 Today's feature is Drachenheim. Drachenheim is card game where the players take the role of young dragons staking claim to their first domain. They have left the protective umbrella of their parent's lairs and ventured out into the world where they must burn, subjugate and pillage the countryside while fending off rivals and obnoxious heroes with flame, tooth and claw. Play proceeds in turns and on each turn the young dragons take to wing and fly out over the land. They can spend their action exploring the wild places and perhaps find treasures to fill their hoard or bands of savage creatures to destroy or dominate. They can fly to nearby villages and towns and subjugate them to provide a regular source of tribute or burn them down and simply carry off whatever they wish. Settlements produce many kinds of resources but dragons care mainly for wealth, cattle and maidens. The size of the settlement, whether it is a village, a town or a city determines which resources they can produce and how much they can have at any time. Wealth is coin and rich goods rarely found in villages. Cattle can be cows, goats, sheep or even horses and are found in great abundance in rural areas. Maidens are young men and women, dragons are not picky about gender. Beware taking maidens in tribute! While they are the most prestigious of treasures and the most delicious of meals the snatching of the citizenry is the leading cause of heroes taking up arms and seeking to slay the marauding dragon. Development is in the early stages but we expect nothing will change dramatically over the course of the project. The young wyrms will always cause trouble for the folk, seek adventure and have to fight for their lives when the natives get restless.